For Electra Glide, Street Glide or Road Glide! 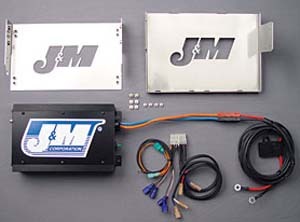 250 Watts: This exciting new 250w fairing speaker amplifier kit has been design specifically for use in the 2006-current Harley® Ultra/Street/Electra Glide fairing, with the Harley HK radio. This is a full range class G amplifier and is spec’d at 125watts RMS per channel, both channels driven, continuous into a 2 ohm load @ 14.4vdc, 70watts RMS continuous into a 4 ohm load. Amplifier mounts to the top of the custom made stainless steel bracket system, which has the slots in the bottom section to properly relocate the Harley CB and XM sat radio modules, if installed. Amplifier itself measures 7 ¼” X 4 ¾“ X 1 ¾”. This is a full range class G amplifier and is spec’d at 125watts RMS per channel X4 channels, (500w total) driven continuous into a 2 ohm load @ 14.4vdc, 70watts RMS continuous X4 channels into a 4 ohm load. 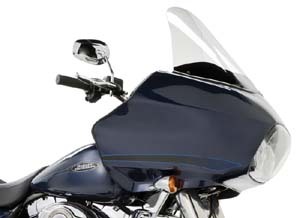 Amplifier mounts to the top of the custom made stainless steel bracket system, which has the slots in the bottom section to properly relocate 2 of the Harley CB, MP3 or XM sat radio modules, if installed. Amplifier itself measures 10 5/8” Long X 5” Wide (widest point) X 1 5/8” Tall. 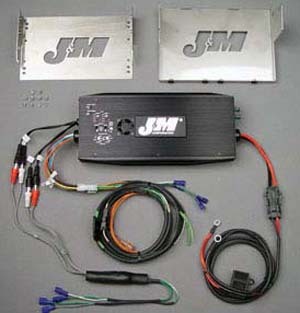 500W Street Glide Kit: THE world’s most powerful 4-ch amplifier for your Harley Bagger audio system. 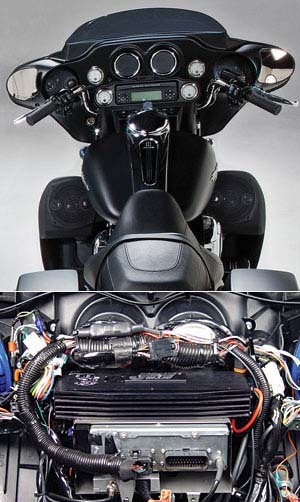 This exciting new 4-channel 500w fairing speaker amplifier kit has been design specifically for use in the 2006-current Harley® StreetGlide with the Harley HK radio, with 2 extra speakers (total of 4) mounted in either the lower fairing position or inside the saddlebags. 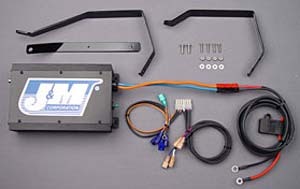 The specific plug-n-play wiring harness included with this kit, takes the 2-channels of audio signal available from the Streetglide version of the Harley HK radio, and provides 4 separate channels of amplification at 125w RMS continuous for each channel. 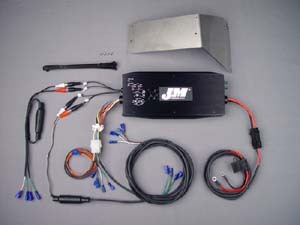 500 Watts: This exciting new 500w fairing speaker/rear amplifier kit has been design specifically for use in the 2011 Harley® RoadGlide Ultra (only) with the Harley HK radio. 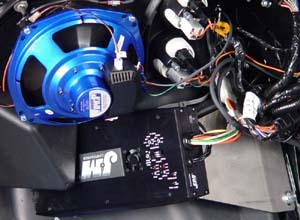 Amplifier mounts to the custom made metal mounting bracket system. IMPORTANT NOTE : Some 1998 thru 2005 model Road-Glides require the replacement of the factory grill assembly/speaker adapters in order for the 250w amp kit and/or 7.25 speaker kit to be installed. It will be necessary to remove the outer fairing and inspect the factory installed grill/adapter assemblies to determine if they need to be replaced. The early style assemblies can be identified by the method of attachment to the inner fairing. If the screws attaching the speaker go completely through the grill/adapter and into the inner fairing mounting bosses you have the early style assemblies and they will need to be replaced with the later style factory grill/adapter assemblies and mounting hardware listed below. 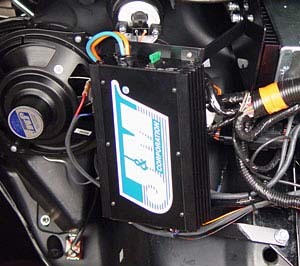 The later style grill/adapter utilizes independent hardware to attach it to the inner fairing then the speaker is attached to the grill/adapter with 4 additional screws. If you have the later style assemblies, the 250w amp kit and/or 7.25 speaker kit will fit with no additional parts or hardware needed.